What blessings does God have in store for the "captives of Jacob"? Nathan Jones: Let's finish this study up of the Gog and Magog War with verse 25 to the end of the chapter. "Therefore thus says the Lord God: 'Now I will bring back the captives of Jacob, and have mercy on the whole house of Israel; and I will be jealous for My holy name—after they have borne their shame, and all their unfaithfulness in which they were unfaithful to Me, when they dwelt safely in their own land and no one made them afraid. When I have brought them back from the peoples and gathered them out of their enemies' lands, and I am hallowed in them in the sight of many nations, then they shall know that I am the Lord their God, who sent them into captivity among the nations, but also brought them back to their land, and left none of them captive any longer. And I will not hide My face from them anymore; for I shall have poured out My Spirit on the house of Israel,' says the Lord God." Vic Batista: These verses hold a world of information regarding what awaits Israel and the wonderful promises God has given them to look forward to. Nathan Jones: Here in this passage God is very focused on the nation of Israel. The Jews are called "the captives of Jacob," Jacob being the forefather of the Jews and the Twelve Tribes. The idea is that after the Gog and Magog War, when God supernaturally destroys the armies that attack Israel and the Jewish people of the world will see that there is a God, then the Jews will give up their Secular Humanism and other false beliefs. They will turn back to God as their King and their Protector. The Jewish people will then en masse emmigrate out of the nations of the world back to Jerusalem and to Israel. We have seen the beginnings of that today. The Jews have been returning to Israel since the late 1800's. They formed their own country in 1948. Since the world is constantly pressuring them to give up their land, which is basically suicide, in an attempt to destroy Israel. But God promises that Israel will not be removed out of their land. They are meant to dwell safely in it. No one will make them leave, because God will defend them. Vic Batista: I'm reminded of the regathering miracle of the nation of Israel foretold there in Ezekiel 37 with the dry bones that come back to life. Israel returning as a nation is a prerequisite to this passage in Ezekiel 38-39. Nathan Jones: Exactly. There has to be an Israel first in order for Israel to become the center of world attention. 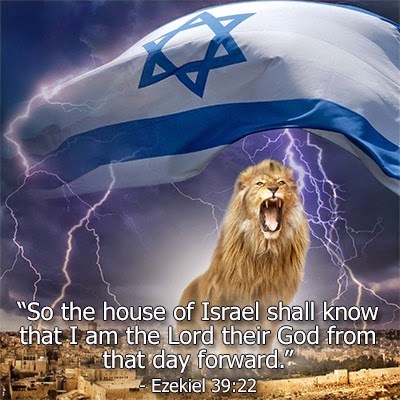 When you back up to Ezekiel 36-37, it foretells Israel being regathered as a nation again. It's been a dead nation for centuries since Israel was destroyed in 70 AD by the Romans. The Jews have been wanderers without a home for almost 1,900 years. And yet, you read these passages in Ezekiel and they are foretelling Israel as the center of world attention. For many years Bible prophecy scholars wondered how Israel could be the center of world attention when there was no nation of Israel. The prophecy was hard to believe, but they believe it because the Bible said so, even if it didn't makes sense. Then 1948 comes and, wow, Israel is a nation again. We therefore must then be in the end times because Israel is a nation again and the center of world attention. Watch the news and you'll see the world's attention, especially from the United Nations, is focused on the nation of Israel. Israel is only the size of New Jersey, and yet the entire world seems bent on forcing Israel out of their land. Vic Batista: Israel being a nation once more and the center of world attention is great evidence about what God is doing and going to do. Because Israel exists, and you can see it and even visit it, you can actually see all these end time events about to happen. Nathan, you have some really awesome statistics concerning the millions of Jewish people who have already regathered to Israel. Some have even come to know Jesus as Messiah in these 50 to 60 years. Nathan Jones: There are roughly 12 million Jews across the entire planet. About six million of them today live in the land of Israel. They have taken a land that was prophesied that when the Jews left would become desolate. Nobody one would want it because it would become barren, and it that's what it became. The Romans actually obliterated the landscape in their goal of destroying the Jewish people in the siege of Jerusalem. Nobody wanted to live in the resulting barren wasteland. The few remaining inhabitants would count the trees for taxation purposes during the Ottoman Empire, because there were so very few trees. When the Jewish people began to come back to Israel, just like the Bible prophesied, they would restore the land. I have been there a number of times and it's like a garden there. The Jewish people turned the parched land back into a garden and made it productive and made it the breadbasket of the Middle East. The Jewish people are continuing to flow back into Israel. Immigration, or aliyah as they call it, has brought the Jews back to Israel. And, we're seeing the world's attention focused on Israel. The whole world seems to want to kick the Jews out of their country, even though the United Nations granted it to them back in 1947. Vic Batista: It doesn't make sense, right? Nathan Jones: No, not at all on the surface. The Muslim's have a day of mourning to remind them that they regret the fact that UN gave Israel their land back. They live to force the Jews out of Israel. Folks watch the news and wonder if the Jews are going to be kicked out of their own land again. And yet, we read Ezekiel 38-39 and it says they will dwell there safely and they will be protected by God. They'll stay in the land at least until the midpoint of the seven-year Tribulation when the Antichrist will rise against them (Zechariah 12:10, Romans 9:27-28, Romans 11:25-27). Many Jews at that time will have to flee the country into southern Jordan, but some Jews will remain in Jerusalem and defend it all the way until the end of the Tribulation when Jesus returns. In the twenty-third and last segment of our study of the Gog & Magog War of Ezekiel 38-39, Vic and I end with what God has to say about the mistaken view of Replacement Theology. I LOVE THE TRUTH, AND YOU ARE PUBLISHING THE TRUTH. ISRAEL....FOREVER !